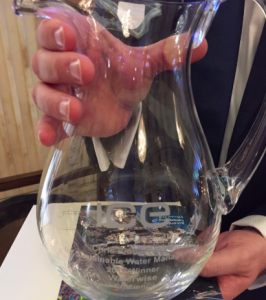 Waterwise’s Water Efficiency Strategy for the UK has been awarded the Chris Binnie Award for Sustainable Water Management 2018. The Waterwise Water Efficiency Strategy for the UK was developed in consultation with the water sector. It sets out a blueprint to deliver a vision of a UK in which all people, homes, and businesses are water-efficient, and where water is used wisely, every day, everywhere. As part of this, a Water UK-supported Water Efficiency Strategy Steering Group has been formed to deliver against the actions in the Waterwise Strategy. Further information on the Waterwise Strategy is available on the Waterwise website here. There were 14 submissions this year. Judges said that the competition was unusually strong, with many of a high standard, including three from overseas. The adjudicators were impressed with both the professional approach, the effort over many years, and the success of Waterwise’s Water Efficiency Strategy and delivery of actions and projects. The award was presented to Waterwise’s Director of Policy and Innovation, Aaron Burton, at the Institution of Civil Engineers’ President and Chris Binnie at the awards lunch on 8th October 2018.